She's known as country music's angel-faced tough girl, but next Wednesday Miranda Lambert will hang up her cowboy boots for a special appearance on the popular NBC drama, Law and Order: SVU. 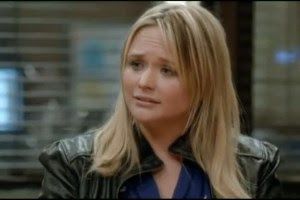 "I love SVU, it's my favorite show," said Lambert in this behind-the-scenes interview of her February 8 episode. "I watch every marathon. It's a [tour] bus staple." Lambert, 28, admits she's never acted before (apart from for her own music videos), and she was initially daunted by the project which has her portraying an actress who is sexually assaulted by the producer of a reality show. "I'm really nervous. I'm really excited. I'm really glad the first time I get to act is on a show that I love so much. I think it's going to push me that much harder to do the best that I can." Watch the interview above for more from Miranda. You can watch a sneak peek of the episode right here. Keep your eyes peeled for Miranda's guest appearance airing Wednesday, February 8th.